TSRJC notification 2018 online application exam date hall tickets results : TSRJC CET 2018 this is the way to the getting admission in to Telangana Residential Junior Colleges for the academic year 2018-2019. So candidates who want to apply for tsrjc 2018 can download and check official TSRJC notification 2018 through main site. After download you check tsrjc eligibility criteria. 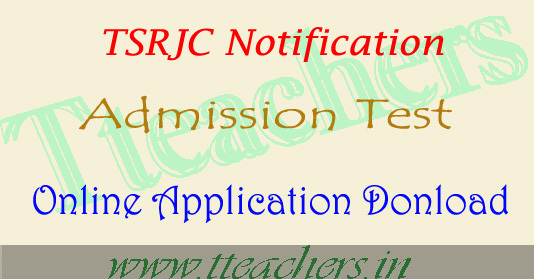 Here we have to given latest updates of TSRJC notification 2018 ie tsrjc 2018 official notification, tsrjc 2018 eligibility,exam pattern,syllabus,previous papers,exam date,hall tickets,answer key,results and counselling dates. TREI Society has established Residential Junior Colleges with an objective to provide quality education to the talented children. Presently, TREI Society is managing 04 TS Residential Junior Colleges (03 for Boys and 01 for Girls). Loco Parent system is implemented by appointing Lecturers as loco parent to a group of 15 to 20 students. Day starts with the physical exercises and Classes will commence at 8.00 AM and academic activities will continue till 10.00 pm in the night. Apart from the academic activities, importance is given to sports and games and other co curricular activities for all-round development of students. TSR Junior Colleges are having adequate infrastructure facilities in addition to well equipped laboratories, libraries, reading rooms and play grounds with well equipped physical education department. The colleges offer free education besides free boarding and lodging facilities to all selected candidates. Special care will be taken for talented as well as low achievers. Loco parent system is adopted to look after and guide the students staying in the hostel. a) Candidate must be a resident of India and must have studied in TELANGANA only. b) Must have passed the qualifying examination in first attempt in March, 2018 only. Candidates who have passed in earlier years are not eligible and need not apply. c) OC Candidate must secure a minimum GPA of 6 and BC, SC, ST and minority candidates must secure minimum GPA of 5 in S.S.C or equivalent qualifying examination and GPA of 4 in English for all the candidates. Candidates seeking admission into Inter I year in 4 TS Residential Junior Colleges for the academic year 2018-2019 have to apply for TSRJC Common Entrance Examination through online by visiting http://tsrjdc.cgg.gov.in. TSRJC notification 2018 ie tsrjc 2018 official notification, tsrjc 2018 eligibility,tsrjc admission test exam pattern,tsrjc 2018 syllabus, tsrjc previous papers download,exam date,hall tickets,answer key,tsrjc results and counselling dates 2018 2019.